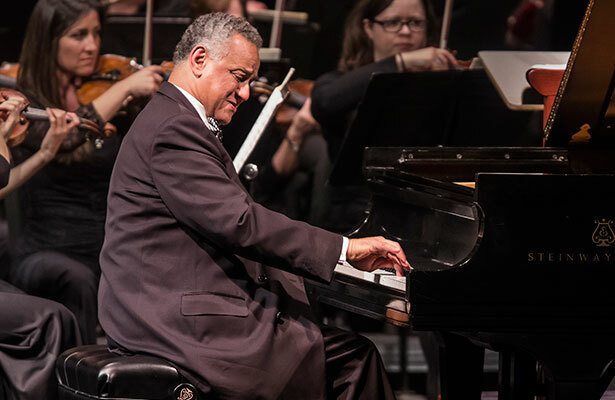 About Friday night’s Pacific Symphony concert with pianist André Watts, one word sums it up - “Magnificent”. When the 71-year-old pianist André Watts sat down to play, he immediately commanded attention by the sheer scale of the sound he produced – big, bold, effusive. The massive opening of the Beethoven “Emperor” Piano Concerto No. 5, with its bravura solo passage and thundering orchestral chords, was as exciting as any Tchaikovsky or Liszt that I had heard Watts play. Except this was Beethoven, where a certain classical poise and lyricism must be adhered to, and in this respect Watts also succeeded brilliantly. In the first movement Allegro, for example, Watts handled the juxtaposition of the heroic and the delicate, the virtuoso and the lyrical, with great drama. The other two movements were no less fine. The nicely dovetailed octave exchanges between the soloist and orchestra, the gorgeous pearly tone in lyrical passages, and the beautifully hushed descending chromatic scales were just some of the highlights of Watts’ artistry in the Adagio and the Rondo-finale. Conductor Carl St. Clair, never rising up to the same level of drama as his soloist, provided acceptable orchestral accompaniment to the proceedings. Moving on to the second half of the concert, Shostakovich’s Symphony No. 10, no one could accuse maestro St. Clair or the orchestra of lacking in drama. On the contrary, the orchestral sound was rich and pliant, full of nuances that spoke of true conviction. Maestro St. Clair showed his affinity for the Russian repertoire in general, and Shostakovich in particular, by shaping long lines with subtle inflections of tempo and accent, especially in the first movement’s epic 25-minute journey from mystery to tragic climax and back. The anti-Stalin Scherzo was appropriately fierce and furious with memorable contributions from the brass. The third-movement, a stark and sardonic dance, evokes Mahler’s nachtmusik and here received brilliant playing from the winds and brass in their repeated statements of the “DSCH” and Elmira motifs. The fast and furious mood resumed in the finale, except this time the powerful music emerged from the dark side into a triumphant autobiographical portrait of Shostakovich himself. Shostakovich’s Symphony No. 10 is not easy-listening, nor is it the purpose of great classical arts to entertain or appeal to the masses as in pop culture (even though it was Friday night). The brave souls in the audience who stayed till the symphony's bitter end deserved kudos for keeping alive 400 years of the classical tradition.